A lightweight pure new wool jacket with an understated check – the perfect finishing touch to any outfit. Jacket: Two button. Single breasted. Classic fit. Three interior pockets. Four button cuff. Angled pockets. Side vents. Fully lined.Dry clean only. Very well made garments, I have bought many times and really enjoy wearing . I think it is natural to be wary of ordering a suit / jacket online as you never really know what you'll get - but I can vouch for the quality of your products as they are always top notch, a great fit and look the part!!! An excellent product speedily delivered. The web site was easy to navigate. I submitted my order on Saturday evening and it was delivered on Tuesday. This is the first time that I have ordered from BT but it most certainly won't be the last. The Jacket was excellent, perfect fit and great quality. I may still be ugly but at least I am well dressed and ugly. 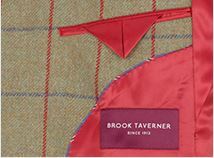 Always very pleased with the service, quality and value from Brook Taverner. This was my first use of Brook Taverner. On line ordering was easy with a great choice of clothing. No problems with delivery, but most importantly the quality of the items I ordered are first class. 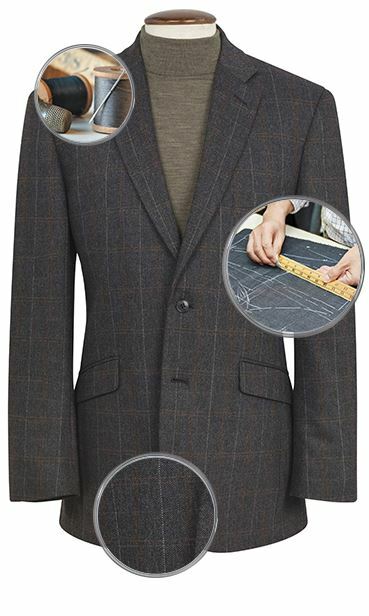 The summer weight tweed jacket is a better quality and finish then jackets I have bought at twice the price. I will definitely be using this company again. Almost as good as the brochure said. A very good buy only slightly off-set by the brochure not indicating it was a 'summer' jacket. This was only mentioned in the e-mail acknowledgement of the order. The jacket was slightly darker than the brochure's illustration. The service and quality of the jacket is superb. I received my order within 24 hours of the phone call. I had to return it as the size was not quite right. The returns procedure was painless and I received the exchange jacket within a few days. I would certainly recommend Brook Taverner. No need to shop around Brook Taverner is excellent! 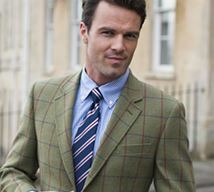 Brook Taverner offer excellent value and quality clothing. Without doubt I would most definitely shop here in the future. Great service, great product and great value. As ever, the service was very good and the process was quick and simple. I loved the jacket I was sent and it was excellent value for what I paid! Brook Taverner had to keep my jacket for me as I was delayed in France for a week; they posted it out on the agreed date and it arrived the next day - excellent service. Order process works well, good website and service. Quality excellent. Great jacket for the Summer. Jacket arrived along with hanger and dust cover. Great fit and very nice coloring, which to me has more of a barley shade to it, rather than what's shown in the photo. Prompt service and excellent value. Delivery was fast and the garment was well worth the price. The service wii certainly be used again. This is a lovely jacket great tailoring and fabric it fits first class, the photo on the web site do not do it just justices. The service that BT give cannot be bettered. All in all a fantastic product and service. Quality tailoring at a very good price. I ordered some trousers and a jacket, but being a new customer was not sure how the advertised sizes actually fitted. Items arrived very quickly and I was impressed with the quality, it certainly lived up to my expectations. I was very happy with the trousers but needed to return a pair - the free return service made this very easy, unlike some other internet tailors. The jacket was too large for me and the next size down, showing off here, was not available. No matter, I selected another and sent off the original. I was concerned that my return slip might not have a clear explanation and so I called the company after 14 days. The staff were delightful, quickly located my order and confirmed that the refund and new jacket would be on their way. The new jacket is excellent and all refunds and replacements were done within 14 days, well inside the time advertised. Excellent service and I shall be a regular customer from now on. Highly recommended. I have received excellent service for good quality products at reasonable prices and prompt delivery. If they increase their range I will have to aquire more wardrobe space!!! 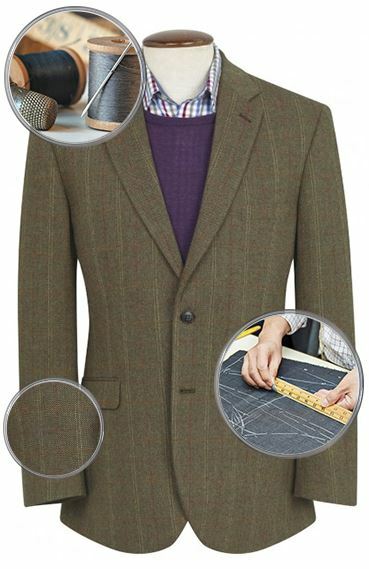 I chose the tweed jacket because of the double pleats at the back, unusual tweed, and lightweight nature. On arrival my first impression was that it was better than the photograph. In the first place I ordered two jackets for my husband - one for winter and one for summer. The summer one was not expected to be available for some time but he didn't mind waiting to receive both of them together. They arrived earlier than expected, and he found that the summer one was a little too large to wear without his winter woollies, so ordered a smaller size. It arrived promptly, fitted better, and the first one was returned by post. My credit card received a credit equally promptly. Both jackets are of excellent quality and he is now looking forward to wearing them. Helpful and friendly customer services via telephone. Up to date re order via email and the garments are fantastic value for money. I would and will order again from this company. Highest quality merchandise combined with excellent customer services. 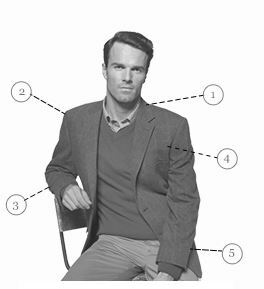 I have bought several jackets from Brook Taverner over the last year or two, some trousers and shoes as well. The jackets in particular are not only of exceptional fabric - soft and malleable - but elegantly tailored as well. Perfection, and perfection is not easy to find these days. I liked the trousers too but almost all their trousers are plain fronted and I am more comfortable with pleats. And the returning of items is hassle-free and the refunding is quick. All in all, the experience has been extremely pleasant. The prices may be a bit high but not for the quality or for the services. I am very pleased with the quality of the product - very well tailored. There was a small mark on the jacket when it first arrived but the courteous and efficient staff on the phone helped sort everything out quickly. The returns service was very easy and a replacement arrived promptly. Was very impressed with the whole process, and will definitely be using them again. Colour slightly darker than pics but still very good. Comfortable and great for wearing tweed in the spring/summer. Really smart jacket. I am 6'2", and the long fit is ideal. Nicely finished and came with a complimentary cover. Looks good with smart trousers, or jeans. Great quality and a great fit. The cut quantity and feel of the jacket is superb. This is a beautiful jacket, I am delighted. why do you not make jackets for men Size 48 chest with short sleeves, the last jacket I bought was regular and had to have sleeves shortened. I am 5ft 10in tall 48 chest and 40 in waist..I have what we call in linconshire corn carrying shoulders from working on a farm 60 years ago! We do have the Osprey Jacket available in a size 48 short, and if you search our full jacket collection, you can use the filter menu on the left side of the page to search only for jackets available in size 48S. Jacket arrived along with hanger and dust cover. Great fit and very nice coloring, which to me has more of a barley shade to it, rather than what's shown in the photo. I have received excellent service for good quality products at reasonable prices and prompt delivery. If they increase their range I will have to aquire more wardrobe space!!! Derek.